The Dungeness Valley Creamery is a family owned and operated raw milk dairy located in Sequim, WA. We practice the most clean and sanitary conditions from the milking parlor to our customers. We eat and drink what we produce, and are proud to be a provider of this high quality natural food throughout Western Washington. 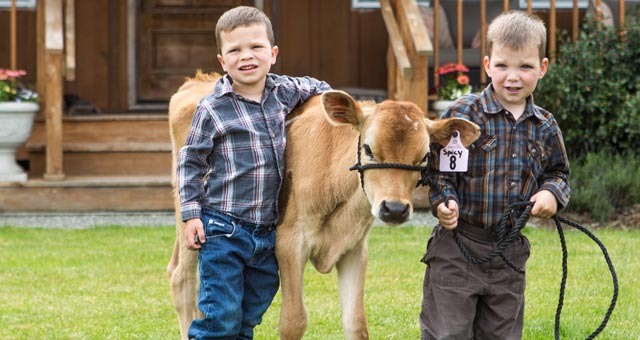 Jeff and Debbie Brown began their farming career in Sequim, WA with the purchase of 20 cows in 1971. In 1973 they moved to a 76 acre farm in Everson, WA where they milked Holsteins under contract to a large milk processor. In 1989 they returned to the North Olympic Peninsula to raise their three daughters in their home town of Sequim, Washington where they built the current farm from the ground up. Sarah shared her parents love of dairy farming. She went to Washington State University where she received a BS in Animal Science with an emphasis on Dairy Production Management in 2003. After college she returned to her family's farm ready to secure her place in the dairy industry. With the rise in industrial farming, family farms continued to go extinct. In a community that once had hundreds of dairies, only a handful of farms remained. It was time to get big, or get out. No longer wanting to be at the mercy of corporate agriculture, they knew something had to change. Sarah and her parents had to look for ways to make the family farm sustainable. They did extensive market research, sent out hundreds of questionnaires, and talked with hundreds of people to ensure there was a demand for local raw jersey milk. Finally, one spring day in 2006, the Dungeness Valley Creamery vision became a reality. In 2008 the development rights of the farm were purchased by a local land trust organization. 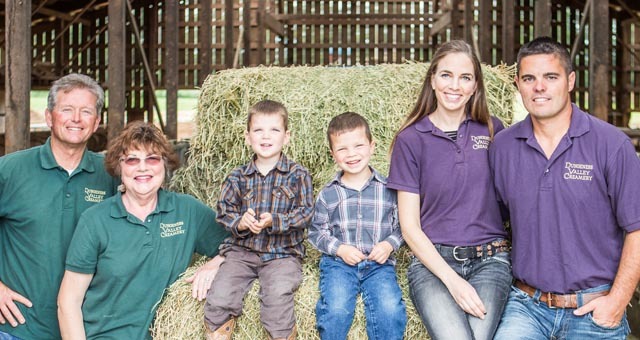 In 2012 Sarah's lifelong dream was realized when she and her husband Ryan took over the farm. Today, the Dungeness Valley Creamery is located on the Dungeness River one mile from the historic community of Dungeness. It is home to 38 acres of lush pasture, 60 Jersey cows, the newly built creamery and the Brown family home. Why Raw Milk? Our raw milk is unpasteurized and non-homogenized straight from the cow. It's milk how it used to be on grandpa's farm, fresh with thick cream rising to the top. Yum! Not only does it taste good, but the health benefits of raw milk are significant. Increasing scientific findings recognize raw milk as a natural treatment for conditions such as high blood pressure, obesity, and diabetes, to name a few. See the "About Raw Milk" section for more information. Please take a look around our site to learn more about our farm, products, and about the many benefits of raw milk. Our goal is to provide the very best raw milk directly from our farm to you! The Dungeness Valley Creamery, a family owned and operated business, exists to honor God through preserving good stewardship of land and cattle. We strive to offer wholesome raw dairy products and a nostalgic ambiance to enhance our communities health, well-being and life. Sarah has a BS in Animal Science with an emphasis on Dairy Production Management from Washington State University. She enjoys managing animal husbandry aspects of the farm and strives to make the animals more comfortable. Ryan has a BAS in Applied Management from Peninsula College. In 2008-2009 as an Army Staff Sergeant he assisted combat units in northern Iraq, providing assessments of complex agricultural projects- aiding commanders in prioritizing reconstruction efforts for the region. Today he applies those skills to the farm with a focus on reducing the farms environmental impact ensuring it will be sustainable for future generations. They married in 2009 and enjoy working side by side on the farm, as well as sharing in the responsibilities of raising their 2 sons Tyler and Wade. 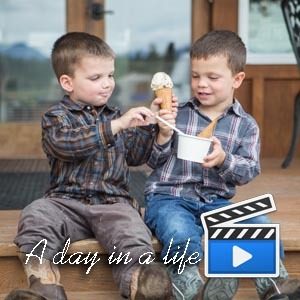 As their two young sons grow up with a playful curiosity for farm life activities, who knows, you just might see our farm and products around for generations to come. We strive to offer wholesome raw dairy products and a nostalgic ambiance to enhance our communities health, well-being and life. If you have any questions about our products or services, please do not hesitate to contact us. We are happy to assist you. © 2018 Copyright Dungeness Valley Creamy. All Rights Reserved.